Zac Efron took a minute between takes during filming of We Are Your Friends, which is set for 2015 release. Photo by Anne Marie Fox. Zac Efron stood by the front of Oviatt Library, one of the sites where We Are Your Neighbors was filmed. Photo by Anne Marie Fox. The weekend of Sept. 6-7 saw the California State University, Northridge community buzzing with activity, as the movie We Are Your Friends, starring Zac Efron, was filmed on campus. Efron plays a young DJ working on what he hopes to be his first hit track in this 2015 release. 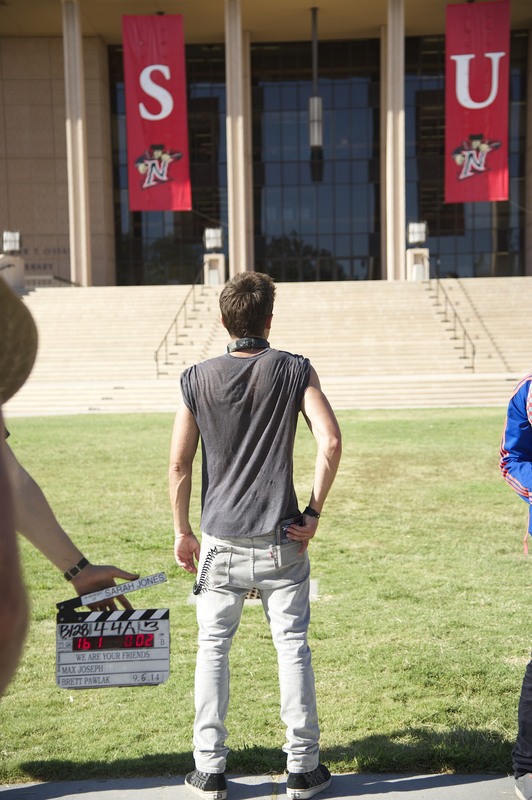 CSUN’s Matador Bookstore and Oviatt Library were backdrops for scenes, and several CSUN students were used as extras for the movie. Check out these photos from the filming.